Norton WiFi Privacy Review - Does Norton Offer a Reliable VPN? They’re the popular antivirus brand owned by security conglomerate Symantec. They also own a VPN (and a free proxy) we recently reviewed – SurfEasy. But you probably don’t know a VPN service called Norton WiFi Privacy. That’s not an encouraging sign. It shouldn’t be that hard to find product information. But that becomes a recurring theme, unfortunately. Before completely dismissing them, though, let’s complete this Norton WiFi Privacy review so you can make up your own mind. LOG FILES/JURISDICTION Minor Logging / U.S.
As the offshoot of a major brand, Norton Wifi Privacy does enjoy a few good features. Their software is legit, protecting you from data leaks and malware. Their underlying infrastructure is also solid, posting strong performance. You can tell they have some subject-matter experts on staff, that can deliver on providing a reliable tech infrastructure. Good VPNs create a secure tunnel around your internet connection. That way, all of your referring data gets forwarded to the VPNs servers. And as a result, all of your data — including the pages you visit or the things you download — are masked with the data of thousands of other users. … only to ‘leak’ your personal information for the world to see. They inadvertently expose your location, despite a little green “connected” check mark showing up on your app. Before allowing you to run ahead and install everything, we do one final check. 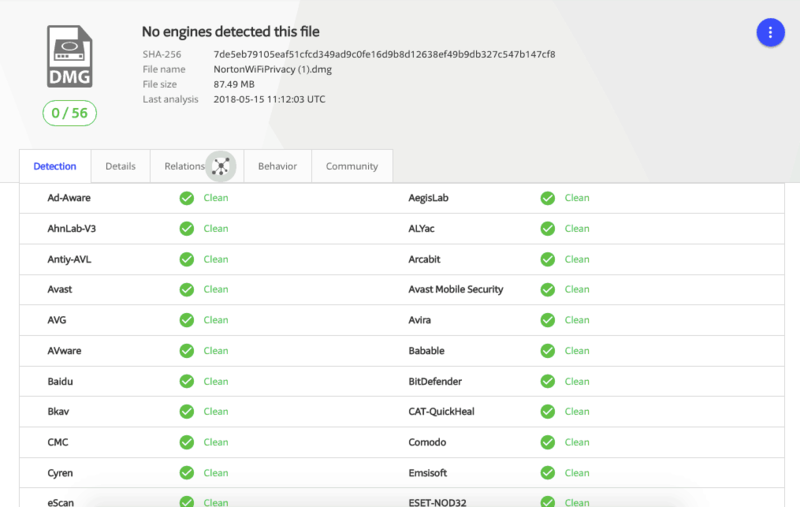 We also run each VPN’s installation files through VirusTotal.com to make sure there are no hidden surprises. 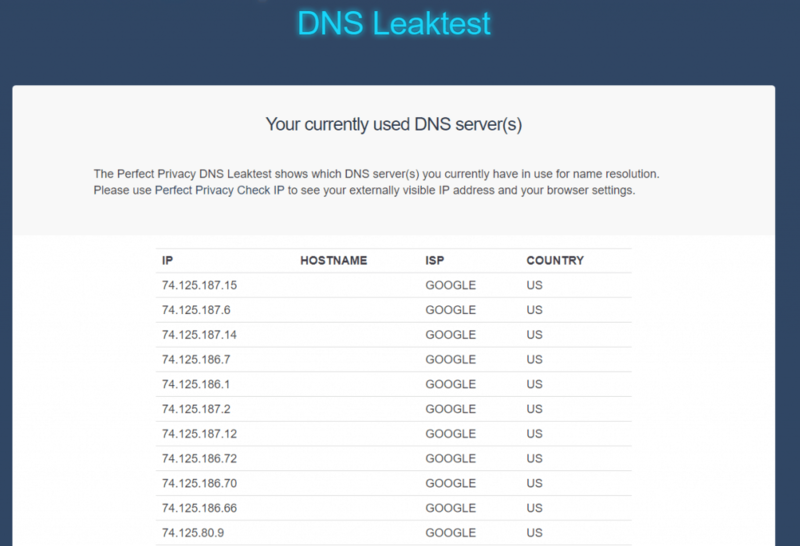 A leak-free VPN connection is worthless if it infects your device with malware in the process. Good news! These tests also came back clean! So far it seems to be a great VPN for data protection… But let’s move forward. Norton WiFi Privacy gets the basics right. VPNs are incredibly important. Technically, there’s a lot going on behind the scenes. But that doesn’t mean they should be overly sophisticated for users. In fact, they should be the opposite. Each VPN client should have the least amount of features possible. You shouldn’t have to dig or hunt or read a manual to figure out how it works. Users should only need to point and click. Thankfully, that’s what we get from Norton WiFi Privacy. Fire up the app it’ll automatically get you connected to the closest server it finds in its system. 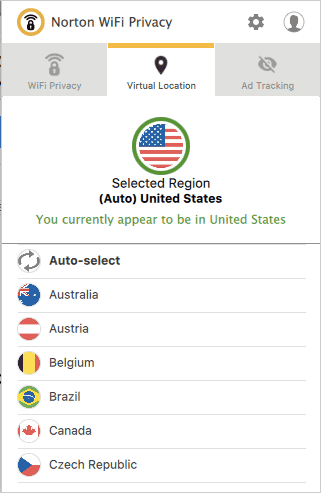 Head on over to the “Virtual Location” tab to toggle between server locations. The only downside here is that they show countries, instead of individual city or server locations. 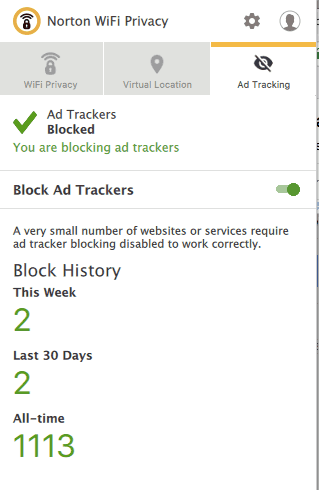 Otherwise, you can also click on the “Ad Tracking” option to see how many malware instances have been blocked. There isn’t really anything to do or click on this view. It’s just a nice little feature to check out and make sure is running properly in the background. Those little green numbers should just keep going up, protecting you from all the sketchy sites out there. Overall, the app experience was quick and painless. The only other hiccup was the install file. I mean, it worked well. But it was massive at over 80mb. So it took a few extra minutes to get going. Those with newer devices and tons of storage won’t mind. Those without, might. Norton Wifi Privacy offered better-than-usual speeds, clocking in at 17th overall (out of 78). We put each VPN through the same exact testing process to come up with this number. First, we run a few speed tests without a VPN connection. This way, we can eventually measure the difference to pinpoint how much we’re being slowed down. Not bad! Each was slowed by only about ~15%, which would go unnoticeable in most cases. Before celebrating, let’s double-check another server just to make sure. Not nearly as good, unfortunately. The combined download speed came out to 127.24 Mbps. Streaming content on Netflix worked three out of four times. Here’s why that’s such a big deal. Streaming services, like Netflix, Hulu, and Amazon, have taken a hard stance on most VPNs these days. In fact, most we’ve reviewed either don’t work (even though they say they do). Or, they literally tell you not to bother. They’re not going to even try sidestepping Netflix anymore. So getting three out of four servers to work successfully is a big deal. Those are the kinds of numbers that we’ve only previously seen from the best VPNs for Netflix. And to be honest, we didn’t expect it from Norton. Big companies are usually risk-averse. Most of the big entities or public conglomerates we’ve reviewed won’t try to thwart Netflix, encourage illegally torrenting content, P2P etc. Those activities are ‘off limits,’ because they really don’t want the hassle, legal battles, or bad PR. Currently, Norton unblocks Netflix (or Hulu) for you. 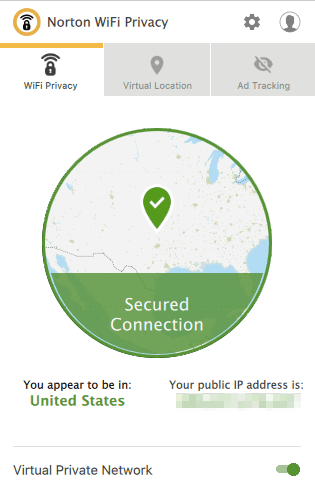 So bypassing geo-restrictions should be OK with this VPN. 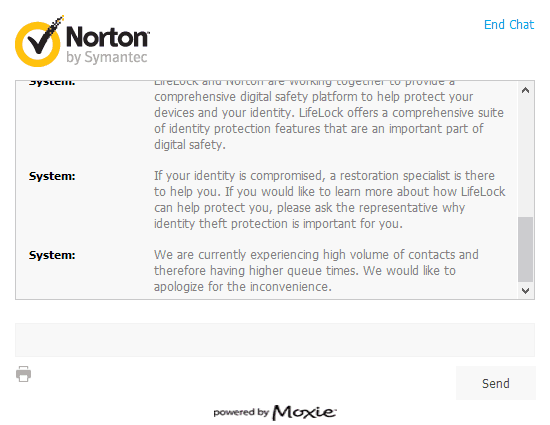 Norton says that it has a no-log policy. Big surprise. So does everyone else. Temporary usage data to assist with debugging a problem with the service. They’ll collect basic data in aggregate (like your bandwidth usage), but not any personal stuff that could come back to haunt you (like your originating IP address). Norton WiFi Privacy delivered some solid infrastructure capable of providing a fast, secure connection. How about no logging, better device compatibility, and helpful customer support, for starters? Norton Wifi Privacy’s parent company, Symantec Ltd., is headquartered in Mountain View, CA. That places them firmly inside the Five Eyes Surveillance Alliance. That’s bad for a few reasons. You already remember that Snowden guy. You know, that whole “the CIA can hack the browsing sessions and messages on your cell phone even when you’re 30,000 ft above solid Earth” bit. The problem is what happens to that data after the CIA collects it. Goes into a database of some sort. Pretty standard. Every intelligence agent from Canada, the U.K., New Zealand, and Australia can access it. Yikes. That’s a lot. Had to use two hands to count that high. Unfortunately for your data and mine, you’d need a helluva lot more fingers to count all the people who now have access to you. 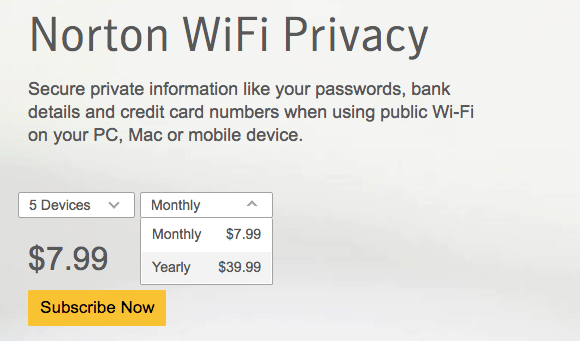 Norton Wifi Privacy can be used on anywhere from one to ten devices, depending on your subscription level. But let’s break that down before you get too excited. They do work on the basic platforms, like Android, iOS, macOS, and Windows. Industry-standards OpenVPN and AES-256 encryption are used. But you can’t switch either. Unfortunately, they do not work with Linux, smart TVs, game consoles. They conceivably work with routers, but only their own. So that’s another upsell. Torrenting is not allowed. Neither is Tor. Not such a great deal now, is it? The name of the software is “WiFi Privacy” and there’s no “VPN” to be seen (or read). That clues you into their customer segment. They’re going after users of their other products, who aren’t necessarily advanced VPN pros. Still feels a little too basic and limited. Especially when you compare the plan features and pricing with the best VPNs in the space. 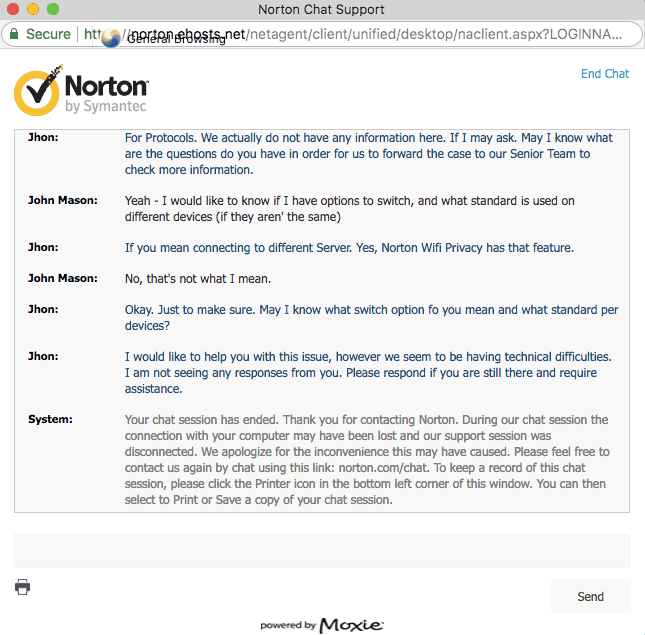 Norton WiFi Privacy talks a big game. They talk about “bank-grade encryption” on their site. But nowhere can you actually find how that’s defined. Go ahead — Command + F your heart out. Customer support. Except, we had to cycle through several support reps to get an answer. When the rep did show up, they couldn’t answer any of our questions. It immediately became apparent that they had no idea what “protocols” or “encryption” mean. THEY’RE THE SUPPORT REPS FOR A VPN PRODUCT AT A CYBERSECURITY COMPANY. The second experience was almost worse than the first. I tried explaining it about ten different ways. Homeboy wasn’t getting it. Then, he killed the chat session because I didn’t respond within a minute of his last message. It was around this time I started questioning humanity. Norton WiFi Privacy’s server data is almost as precious as its protocols and encryptions, apparently. Good luck finding it transparently on their site. We were able to uncover that they only have servers in 28 countries. And that’s an issue for us. Most companies lie. They lie about their total number. They lie about the countries they’re in. And they even lie about data retained. For instance, if a VPN “doesn’t log,” but actually rents servers from other third-parties… do those third-parties log? But generally speaking, you want to go with a VPN provider that has a strong worldwide network of servers. Both factors increase your odds at consistently seeing faster speeds. So 28 countries doesn’t really cut it, to be honest. You can bring those numbers up or down slightly by switching the number of devices. For example, if you only want one connection, the monthly number drops to a more budget-friendly $4.99. You can go up to 10 simultaneous devices. Oddly, the Android app only has a seven-day trial, while the iOS one has a full 30-days. However, there is a full 60-day money-back guarantee. That’s among the most generous we’ve seen. They accept all major credit cards, like Visa, MasterCard, American Express, Discover, and JCB. They also accept PayPal. But otherwise, no cash or cryptocurrency is accepted – so no possible way to pay anonymously. Do We Recommend Norton Wifi Privacy VPN? Norton Wifi Privacy offers a solid connection. They offer fast server speeds. And they offer a user-friendly app. However, the list of things they don’t offer is much longer. They don’t offer a user-friendly jurisdiction. They don’t offer good device or platform support, nor torrenting or Tor. They also haven’t implemented a kill-switch to their service which might be a turn-off for a lot of people. They don’t offer that many server loactions. And they don’t offer knowledgeable customer support who knows what they’re talking about. So despite some pluses, we can’t recommend them. Check out our top ten VPNs for alternative options. After my Windows 10 computer wakes up from "Hibernate" Norton Secure VPN does not seem to reconnect. It seems to turn off and requires a manual restart is needed. It seems to automatically start just fine when there is a hard reboot, otherwise, I've learned to check to make sure that it's on. It will restart with a Windows start, I did check that option. The previous version Norton WIFI Privacy had the same problem. Also, from time to time, it does show that it's on, but it doesn't automatically connect to a server. The icon shows that the program is on, but it hangs when automatically connecting to a server. Changing countries does not help when that happens. That's happened to me after a soft reboot of windows. When that happens, I need to turn the program off and restart it. I like the program fine, it works invisibly, but I've learned to double check that it's on and actually connected and not simply assume that it's on and actually connected.